It was odd, because the man looked vaguely familiar. Once we sat down, our seat buddy helped us figure out why. 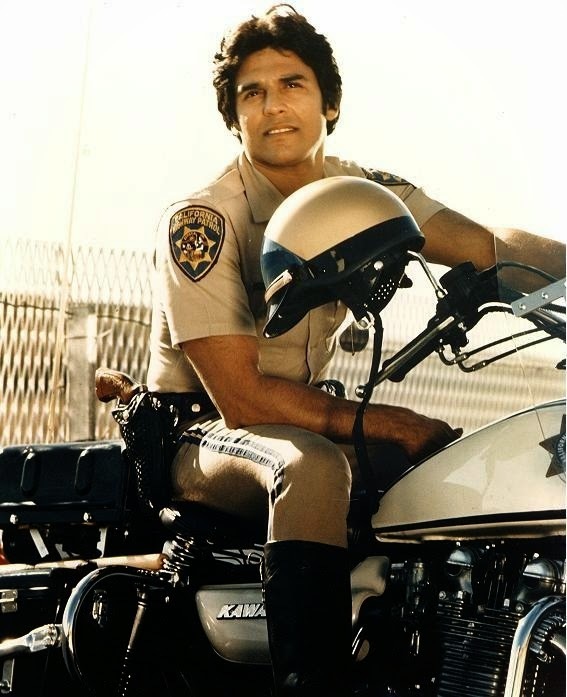 His name is Ricky Estrada...he was Panch, a California highway patrol cop on the popular 1980’s television show CHIPS. Anyway, after that incident, I have to admit, I was fairly proud of myself. Not so much because my wife had been hit-on by a TV star...but because I was pleased I'd been able to come up with a retort on the spot. Even so, as we spent the next couple hours flying...new and better responses kept jumping into my head...Oh, I should have said, “And she’s all mine” or no, I should have said -- “You have no idea”. I’m sure you’ve done this before...you know, spent time replaying encounters in your head and coming up with all the things you wish you would have said. Well, allow me to introduce you to a master of the zinger. His story is in John chapter 9. At the beginning of this chapter, Jesus and his disciples are walking along, and they see a man who has been blind from birth. After a little lesson, Jesus spits on the ground and makes mud and then rubs it on the guys eye sockets and then tells him to go wash up. Amazingly, he does this and he is healed. The people who used to see him begging see him walking around and are confused...Is this really the man who was blind? After asking him what happened they take the man to the Pharisees and I want you to read this part. Now the day on which Jesus had made the mud and opened the man's eyes was a Sabbath. Therefore the Pharisees also asked him how he had received his sight. "He put mud on my eyes," the man replied, "and I washed, and now I see." Some of the Pharisees said, "This man is not from God, for he does not keep the Sabbath." But others asked, "How can a sinner do such miraculous signs?" So they were divided. So the religious experts are split – some are saying “He broke the Sabbath, he’s a sinner” and others are saying “He healed this man, he’s a saint”. Then someone suggests that maybe the man wasn’t really healed, that he’s just making it up, so they call in his parents and ask if he was really born blind. His parents confirm that he was indeed born blind. The Pharisees are at a dead end with them, so they bring in the man again and tell him to confess his lie. A second time they summoned the man who had been blind. "Give glory to God," they said. "We know this man is a sinner." He replied, "Whether he is a sinner or not, I don't know. One thing I do know. I was blind but now I see!" Then they asked him, "What did he do to you? How did he open your eyes?" He answered, "I have told you already and you did not listen. Why do you want to hear it again? Do you want to become his disciples, too?" Then they hurled insults at him and said, "You are this fellow's disciple! We are disciples of Moses! We know that God spoke to Moses, but as for this fellow, we don't even know where he comes from." The man answered, "Now that is remarkable! You don't know where he comes from, yet he opened my eyes. We know that God does not listen to sinners. He listens to the godly man who does his will. Nobody has ever heard of opening the eyes of a man born blind. If this man were not from God, he could do nothing." To this they replied, "You were steeped in sin at birth; how dare you lecture us!" And they threw him out. Then, nailing the final nail in their own coffins, the Pharisees say “What do you know? You were born in sins!” This is one of those misfired comebacks. By saying he was “born in sins” they were actually admitting that he was born blind. And if he was born blind, but now can see, then obviously he has been healed and their whole line of reasoning crumbles. I love this story. I always have a good laugh at the expense of Pharisees. But, I have two questions I want to ask. First, Where did the Pharissees go wrong? How could they possibly have been so blind to the presence of the God? And second how did the blind man get it right? Where did the Pharisees go wrong? Certainly, the Pharisees were wrong about what it meant to keep the Sabbath. Mixing mud and applying spittle were not violations of God’s Sabbath law as they believed. The Pharisees went astray by having a flawed interpretation of what it meant to obey God’s will. Luckily for us, our interpretations are always flawless. The fact of the matter is that we all have less than perfect understandings of God’s will. And I don’t think we can fix that – even if we were all to pursue Ph.D’s in exegesis, this wouldn’t change because it’s just not a problem of education, it’s a problem of human finitude. The Pharisees were wrong about the Sabbath, and we are like the Pharisees; we never get it completely right. But we don’t have to despair because the Sabbath issue is wasn't the real problem. Being wrong is not the same as being blind. What blinded the Pharisees was their second error, one which I pray we can avoid: they didn’t start with the miracle. Remember vs. 16: “Some of the Pharisees said, “This man is not from God, for he does not observe the Sabbath.” But others said, “How can a man who is a sinner perform such signs?” They were divided about whether to start with the miracle, or start with the apparent breach of Sabbath. They had to choose. If they started from the miracle, they would conclude that Jesus was from God. But if they started from the (presumed) Sabbath breach, Jesus would look like a miracle-worker leading people away from Yahweh. Deuteronomy 13 had warned of this, saying that those with supernatural powers who lead people away from God should be executed, and the Pharisees had memorized this one. The Pharisees decided that they knew one thing -- “We know he is a sinner!” they said. The blind man started with the miracle...and he saw Jesus for who he was. Starting with the miracle transformed the blind man into the only one who could truly see. You know, it’s not that hard to miss the time of God’s coming – all we have to do is start with anything other than the miracle of God's present action among us. The Pharisees had God in human flesh, walking, teaching and healing among them...and they could not see him. The irony is that they were blind precisely because they were so confident they could see. We, too, have God present and active among us. (This is a revised sermon preached in 2006 in a Preaching Practicum class at Fuller Theological Seminary). *By the way, this 'starting with the miracle' hermeneutic is pretty much what seems to have induced Peter and the Jerusalem Council to legitimize Gentile Christianity. Thanks Brad. I found it helpful in my own quest to avoid the dangers of zealous and professional religiosity. I welcome any other thoughts.